Why join a business accelerator? 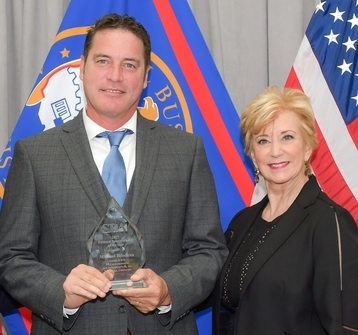 Photo above: Michael Bilodeau, President, IO Environmental and Infrastructure was recognized as the SBA's National Subcontractor of the Year by SBA Administrator Linda McMahon, at the SBA's Small Business Week Awards Event, in Washington, D.C.
Photo above: Lars Herman, President, Herman Construction Group, Inc. was recognized as the second runner-up for the National Small Business Person of the Year Award by SBA Administrator Linda McMahon, and Ivanka Trump at the SBA's Small Business Week Awards Event, in Washington, D.C. Note: Photos above have been cropped to fit document. The SBA San Diego District Office conducted a successful SBA Day and Lender Fair, on April 19th, at the Ramona Women's Club, in Ramona, California. The event was hosted by the Ramona Chamber of Commerce. Photos above: (Top) Tony Knott, of the California Board of Equalization provided a presentation on California Small Business Permits and Taxes. (Row Two Left to Right) Maricela Segura, of the Federal Trade Commission provided Cyber Security Tips to attendees and Realuz Bisa, of U.S. 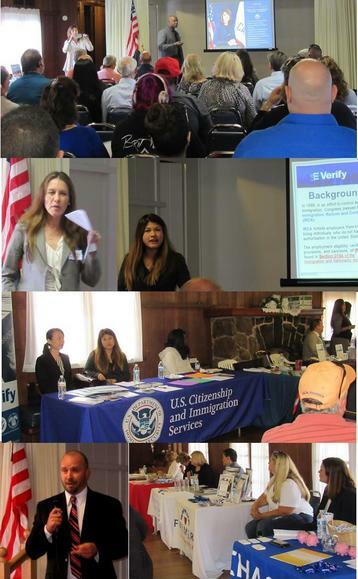 Citizenship and Immigration Services gave attendees an update on the new I-9 Form requirements for employees and the E-Verify system. (Row Four) Tom Ladegaard, Attorney, spoke on the Legal aspects of being in business. Presentations were followed by a Lenders Fair, One-on-One Counseling, and Networking with Presenters and Fellow Attendees. 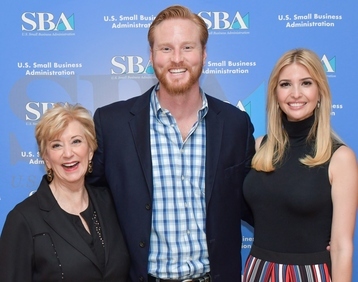 Exhibitors included representatives from SCORE, the Small Business Development Center, the SOCAL Veterans Business Outreach Center, several local lending institutions and some Ramona Chamber of Commerce business members. SBA thanks the Ramona Chamber of Commerce for helping us coordinate this event and for the fabulous food provided for all participants. Photo above: SBA Deputy District Director Jill Andrews provides opening remarks. 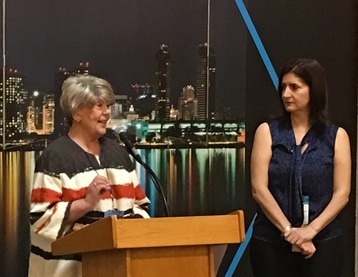 (Right) Alejandra Mier y Teran, Executive Director of the Otay Mesa Chamber of Commerce, moderated the opening ceremony at MEXPORT. Photo above: (Right) Cynthia Harris, SBA District International Trade Officer, assists MEXPORT attendee. MEXPORT is an annual cross border business expo, in the Cali-Baja region promoting trade and business opportunities. This year, MEXPORT, hosted by the Otay Mesa Chamber of Commerce, had 125 booths and approximately 2,000 attendees. A diverse group of industrial suppliers and service providers participate in this important trade show every year. Photo above: Carrie Brooks, Senior International Trade Specialist, U.S. 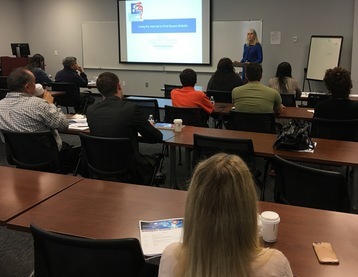 Export Assistance Center - San Diego was a featured presenter at the second session of Export University. 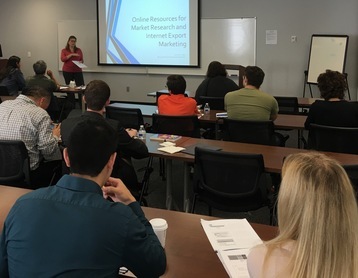 She provided attendees with a variety of online resources to help them research their export markets and connect with foreign buyers. Photo above: Lynn R. Hijar, President & CEO, iBiz247 Network, also a featured presenter, provided additional resources to help attendees find and enter new export markets and utilize digital tools to find international business opportunities. Also, Cynthia Harris, SBA District International Trade Officer, provided an overview of SBA's programs and services, highlighting export assistance programs; and Victor Castillo, Director, San Diego CITD, provided opening remarks and a presentation on ways to locate and participate in foreign and domestic trade shows, as well as, how to take advantage of the CalSTEP program to help finance participation in international trade shows. Why join a business accelerator? Wonderful support, validated blueprints, industry-specific mentors, and the carved out time to work on the launch of a new business idea or scale an existing business. 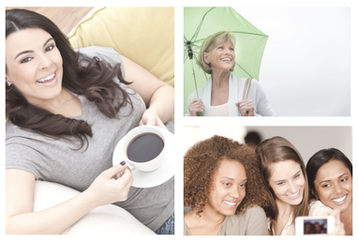 Why join a female-focused accelerator? Finding your tribe, increased confidence and like-minded instructors and advisors who have the philosophy of "support as you rise”. Are you ready to launch a biz idea or just are stuck on growing your own existing business? Hera Labs is a business accelerator for female entrepreneurs that equips you in executing on your goals towards growth in a validated method for businesses. Here is an article about the top 10 reasons to join a LAUNCH or SCALE intensive program.